madrat wrote: Something tells me the YF-23 would have adopted TVC if there was a multiple round tender. Same thing, YF-22,would have adopted any superior features of YF-23. Sure the competitors would have ended up with a homogenized - maybe even a generic commodity style - results, but is that a bad thing? Speaking of which, do what know what transferred from the YF-23a to the F-22? First I heard it was the YF-23a's blistering speed. Now I'm hearing about engines... which I assume is related? It seemed the YF-23a's speed/stealth advantage was related more to shape, but maybe I'm wrong? The YF-23 was said to more closely follow area ruling than any other aircraft, while the YF-22 looked like someone beat an F-15 with an ugly stick. The F-22 seemed to incorporate some of the shaping of the YF-23, and may have gotten some the avionics planned for the latter. Let's be honest: it's all about looks. The performance of the two aircraft probably would not have been significantly different, but the YF-23 just looked so much better than the the YF-22 that we want to imagine it won. Kind of the opposite of what happened in the JSF competition. Not many fans lamenting the loser there. The YF-23a was like an art sculpture. And deadly one at that. I have no doubt the final version would have looked even better, and for sure would have been more lethal. They would have worked out the wrinkles in those GE engines, came up with a much better tiles/heat management system and of course, weapons bay. mixelflick wrote: The YF-23a was like an art sculpture. That is one thing NOBODY will ever say about the X-32 in the X-35 v X-32 debate. It wasn't bad, but I must say I'm really partial towards the (Y)F-22's more "angular" appearance. Fact is, she's a very photogenic one! The AN/APG-77 was a Westinghouse/Texas Instruments design, and both the Northrop and Lockheed ATF teams chose the Westinghouse/Texas Instruments design over the Hughes/General Electric design. Incidentally Westinghouse was acquired by Northrop, I believe. 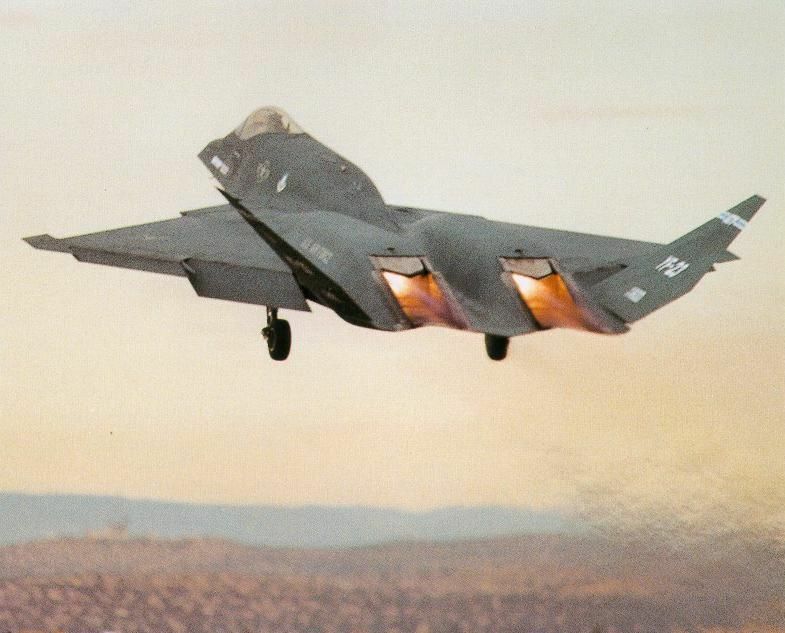 And no, the YF-23's speed is more than just engines, since the YF-22 had the same engines. The GE YF120 and P&W YF119 are separate and NOT related. The F-23 probably would've had better overall supersonic performance than F-22. The F-22 got faster than the YF-22 because the rear fuselage was slimmed down considerably, since thrust reversers were deleted, and the overall shape was refined to reduce wave drag. A lot of the simple questions you're asking can be answered if you just read published material on the ATF that's been out for more than a decade, like this one. YF-23 looks like Rockwell's ATF concept art and Lockheed's YF-12A had a baby. The rear of the YF-23 was overly complicated, if they had a exhaust design similar to the F-35's LOAN, it would've had a better chance of winning. KamenRiderBlade wrote: The rear of the YF-23 was overly complicated, if they had a exhaust design similar to the F-35's LOAN, it would've had a better chance of winning. I remember way back when I was just a "weeone" reading about how the YF-23 used the same (or similar) heat tiles that the space shuttle uses. I would assume that would have increased the cost of maintenance over the course of the aircraft's service life. I think there is a problem doing that with a twin engine aircraft--you have to consider interference and how the radio waves bounce off both. You know you guys keeping talking out of your a$$ for another month or you could check out this presntation by Northop's Tony Chong. charlielima223 wrote: I remember way back when I was just a "weeone" reading about how the YF-23 used the same (or similar) heat tiles that the space shuttle uses. I would assume that would have increased the cost of maintenance over the course of the aircraft's service life. That depends on the reconfiguration with a LOAN nozzle, will there be a fixed structure in the middle like the PAKFA with a rear pointy bit, or will the Nozzles be Side by Side. I'm for having a structure in the middle to help create a larger internal structure for internal weapons bay. Also having the LOAN Nozzle reflect the Radio waves off a larger fixed central structure makes it easier to calculate / control the Radar Signature off reflection, including the V-Tail. Noticed a few things. Its often said that the YF-23 was superior in the following ways. The YF-23—contrary to popular belief—did not have an overall top speed that was any faster than the YF-22. Both jets were limited to an aerodynamic max speed of about Mach 2.2 as a result of their fixed-ramp external compression inlets. In fact, operational F-22 Raptors are “red lined” at exactly Mach 2.0 with an artificial placard because the aircraft’s stealth coating are prone to delamination if the jet went any faster—particularly around the canopy. But it would still have better range although I would doubt the production model will retain the range of the YF-23 prototype. Lastly Both the YF-119 and 120 were deemed next generation engines.